Sun Basket was one of the first meal delivery services that was ever introduced to me by a friend. Their first words were, “If you’re looking to cooking healthier meals that actually taste good, check out Sun Basket.” I was a bit skeptical, considering I was already a pretty bad cook and my healthy eating consisted of grilled chicken with a side of heated frozen veggies. However, Emily and I decided to give Sun Basket a try to see what they’re all about. 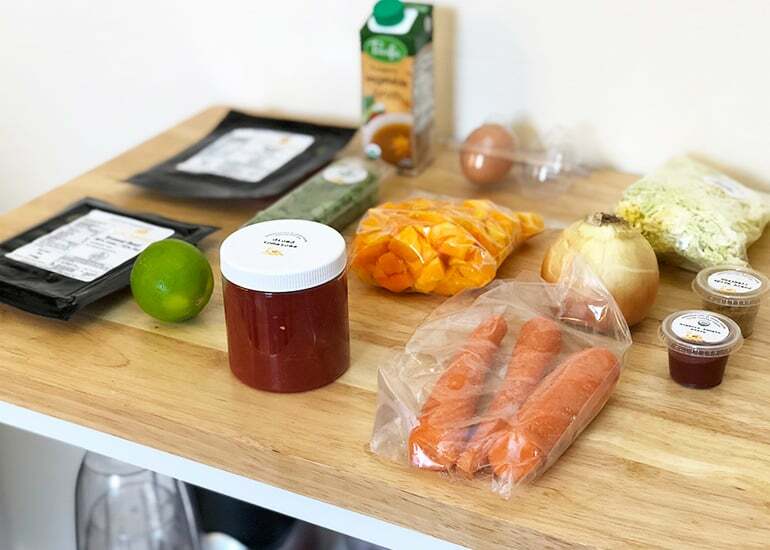 If you’re unfamiliar with Sun Basket, they’re a meal delivery service that focuses on bringing you healthier (yet also tasty) food options when compared to some of the meal kits on the market. Keep reading my full review below to see the ins and outs of Sun Basket, what makes it different, and what my experience was like. Sun Basket is a company that’s committed to making fresh, healthy eating more enjoyable for their customers and their families. They focus on keeping their food as clean as possible, using organic and non-GMO produce, humanely raised meat that’s free from antibiotics and hormones, as well as seafood that has been approved by the Monterey Bay Aquarium Watch List. They have a large variety of options to suit different dietary needs. These options currently include vegetarian, paleo, and even gluten-free. I’ve heard from friends that they are looking to expand their meal plans to include vegan and possibly even keto meal options. Each recipe you’ll receive in your box has been developed by their award-winning chef, Justine Kelly. You may have actually seen her before. She appeared on the wildly popular show, Iron Chef (the American version). She’s also held very high positions in the restaurant world before starting Sun Basket. I found ordering on the SunBasket.com website to be effortless. They’ve streamlined all of the steps and taken out unnecessary ones. This led to me being able to checkout in less than 30 seconds. To get started with Sun Basket, you’re first prompted to enter your name, email address, and zip code. They also ask you to choose a password so they can set up an account for you. Having an account is essential because you’ll need to log in to be able to manage things in your account such as your meal plan options and your delivery schedule. The first decision you’ll have to make is which menu you’d like to order from. They offer a Classic Menu, as well as a Family Menu. The Classic Menu will get you three recipes per week, which are two or four serving each. The Family Menu contains two or four recipes each week and every meal has four servings. If you decide to go with the Classic Menu, you’ll have a few meal plans to choose from. Sun Basket offers the following: Chef’s Choice (fresh, seasonal recipes with quality ingredients and homemade sauces), Vegetarian (meatless recipes with organic produce, plant-based proteins, and vegetarian sauces), Paleo (recipes free of grains, soy, corn, dairy, and gluten – contains plenty of lean meats and seafood), Gluten-Free (meals with gluten-free grains and pasta, quality meats and seafood), Rise & Shine (two quick breakfasts and two chef’s favorite dinner recipes). With the Family Menu, you’ll have fewer options to pick from for your meal plan. You can choose the Chef’s Choice meal plan, Vegetarian, or Gluten-Free. When ordering from the Family Menu, Sun Basket sneaks plenty of vegetables into their recipes and focuses on kid-friendly flavors. They also include family favorite dishes which are geared more towards children’s taste. It’s a great way to get them eating healthy while still allowing them to enjoy the foods they love. No matter which one you choose, you’ll still be able to choose your own recipes every week. This ensures you’re able to choose the items that suit your tastes. You also have the option to let the chef select meals for you if you’d like to be a little adventurous. You’re able to choose any recipe you like, no matter which meal plan you wind up choosing. The only thing you aren’t able to do is mix and match between the Classic Menu and the Family Menu since they are two different serving sizes. If you ever decide to switch your meal plan, you can do so online via your account setting. As mentioned above, Sun Basket has plenty of options when it comes to the meal plans they offer. If you’re vegetarian, paleo, or gluten-free, you can choose the plan that best suits your dietary needs without worrying that it’s going to limit your options. To give you an idea of the types of meals you can expect to receive, you can visit their website to view the current menu, as well as past and future menus. 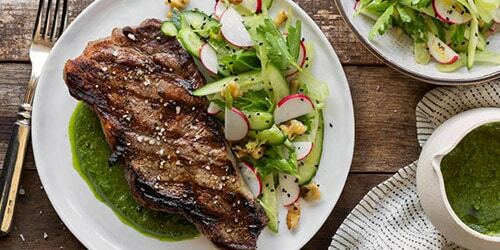 Some of the recipes include: Steak Fajita Lettuce Wraps with Guacamole, Chipotle Chilaquiles with Black Beans, Grilled Chicken and Summer Vegetables with Yuca Mash and Chimichurri, and Quinoa and White-Bean Burgers with Roasted Sweet Potato Fries. They even have breakfast options each week, where you’ll see recipes such as: Fried Eggs with Green Romesco & Overnight Strawberry-Chia Pudding, Fresh Herb and Goat Cheese Scramble & Mango-Chia Overnight Oatmeal, and Mixed-Berry Smoothie Bowls & Summer Squash Frittata. These dishes are perfect for anyone who wants two quick and easy, yet nutritious, breakfasts each week. Being able to choose a variety of meals instead of being stuck with whatever they want to send you is a big plus when it comes to Sun Basket over some of the other meal kits. If you’re interested in trying Sun Basket for yourself, you’ll first need to see if they deliver to your area. They’re currently shipping to most zip codes across the United States, excluding Alaska, Hawaii, Montana, and parts of New Mexico. You can visit their website to see if your area is covered, but they are said to be working on more delivery options in the future. Once you’ve placed your order, you can expect your delivery to arrive on Monday, Tuesday, Wednesday, or Thursday between 8 AM and 8 PM. The date and time of your package’s arrival will all depend on your delivery area. The box you receive is made of 98% post-consumer cardboard. Once you’re done with it, you can recycle it instead of trashing it and causing excess waste. You can even recycle the insulation inside the box. The insulation is actually made from recycled water bottles. When you’ve unpacked the box, roll up the insulation, seal it with the enclosed sticker, and send it off for recycling. To dispose of the ice packs, you can cut them open and pour the mixture into the trash. The ice packs contain a gel that’s 98% water and 2% non-GMO cotton, but it’s not wise to pour this down your drain. Empty it into the trash instead, where the water will evaporate and just leave the cotton behind. The lining can be sent to recycling centers that accept #4 plastic films. Plastic jars and bags you receive are also #4 plastic and will need to be sent to a local recycling center that accepts this type of plastic. The containers inside your box are compostable, plant-based plastic, or recyclable plastic. Any containers labeled “Greenware” can go in a composting bin, while any others should be recycled. 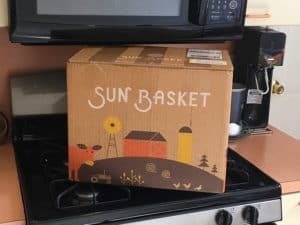 Throughout our testing and reviewing of various meal delivery services we’ve found Sun Basket to have one of the most environmentally friendly packages currently available. When shipping food all over the country, there’s often a concern about ingredients not being fresh by the time they arrive on your doorstep. To prevent this from happening, Sun Basket has taken the time to carefully engineer packaging to ensure it does its job at keeping your food fresh, delicious, and safe to consume. You won’t have to worry about anything spoiling before you receive it. They do, however, offer a 100% money-back guarantee on all food they ship. If you do find there’s a problem with your order, just contact them within seven days of delivery to discuss refund options. With the exception of Blue Apron, Sun Basket is one of the few meal delivery companies that offers a money back guarantee on every box they ship. For curious but wary customers, this is a big plus and it definitely put my mind at ease when making our first purchase. Whether you’re purchasing ingredients from the grocery store or receiving them through a food box subscription, you want to make sure everything is high-quality. That’s exactly what you can expect with the meal ingredients you’ll find in every box from Sun Basket. They’re a certified organic retailer through California Certified Organic Farmers (CCOF) and aim to provide customers with only the best ingredients. Being organic, everything they use is produced without toxic fertilizers or pesticides. The ingredients are also free from genetic engineering and they also use sustainable practices to help mitigate the spread of unwanted GMO cops and contamination. Sun Basket takes the time to carefully screen the suppliers they used to receive produce. They also choose produce that is non-GMO and free of various herbicides and pesticides. The meats and seafood are free from antibiotics and artificial hormones, plus they come from fisherman and ranchers who are also committed to sustainable practices. Organic ingredients are always used whenever possible. However, there are times when organic ingredients aren’t available due to the weather conditions and seasonality. Anything that is organic will always be clearly labeled so you can see it when you open your box. Everything is packaged to ensure it stays fresh during transportation. However, you should be sure to immediately refrigerate the ingredients after removing them from the box to ensure they they stay as fresh as possible. Sun Basket works by providing you with the ingredients you’ll need to cook a delicious meal. They don’t come already prepared, so that means you need to be ready to do some work in the kitchen. Fortunately though, the meals really aren’t difficult to prepare and you’ll receive step-by-step instructions to guide you along the way. Our only minor note regarding the recipe card is that I wash they were slightly clearer. We noticed they had to make the text shorter to fit everything on one page. It’s not a huge deal but it would definitely help to have images on each step of the cooking process like some of the other meal kits do. They do recommend having a few key ingredients on hand in your pantry when cooking their dishes. You’ll want to have olive oil, grapeseed oil, or sunflower oil, plus salt and freshly-ground black pepper. These small ingredients last a long time so they’re good to have in the kitchen regardless. As for kitchen equipment, you’ll need the basics like pots and pans, knives, a vegetable peeler, grater, zester, cooking spoon, spatula, ladle, and measuring cups. You’ll want to consume seafood and shellfish within three days and meat and poultry within five days after the arrival of your delivery. Delicate greens and fresh mushrooms are best used within five days of receiving your box. We were pretty blown away at the taste when it came to our Sun Basket meals. Each one was incredible. This probably has to do with the fact that they use high-quality ingredients across the board in all of their meals. Those ingredients really bring out the flavor in each dish. Linguine with summer squash, tomatoes, and fresh mozzarella: This colorful and lightly sweet dish combined two of my favorite things (paste and cheese). The addition of the summer squash plus tomatoes made this meal healthier than just your average pasta and cheese dish. And even though it was a pasta dish, it was only around 700 calories. Bucatini with chicken, goat cheese, and walnuts: This was the dish I was most surprised that I enjoyed. Something about goat cheese and walnuts confused me but then I tried the final meal and I was convinced this was easily one of the top pasta dishes we’ve ever made. The way that the pasta is cooked, it picks up a slight flavor of the chicken, which gives it a really unique flavor. Bibimbap with snap peas, carrots, and fried eggs: This was my first time ever trying Bibimbap. I picked it for the sole reason that I wanted to try something new with this meal delivery service. While it wasn’t my favorite meal that we cooked, it was enjoyable and certainly something I would eat again. There are two menus for you to choose from when ordering with Sun Basket. You can opt for the Classic Menu or the Family Menu. With the Classic Menu, you’ll receive three recipes per week. Each recipe contains two or four servings and the price per serving is $11.49. The Family Menu contains two or four recipes per week. Each recipe contains four servings and the price per serving is $9.99. You can skip a week or cancel at any time you need to. All you have to do to skip a week is log into your account and head over to the “Schedule” page. From there, you can edit your schedule according to your needs and skip any weeks when necessary. Overall, we were very impressed with Sun Basket. This meal delivery service is now one of our favorites. Regardless of whether you’re looking to cook “healthy” meals of not, I would recommend their service to anyone looking to try meal kits. Why? They get every aspect of meal delivery right — easy ordering, environmentally friendly packaging, great selection of meals, etc. Their dedication to using only the best ingredients and using sustainable practices shows how much they care about delivering their customers the highest quality meals available. Having the ability to choose your own meals ensures you’re able to pick the dishes that suit your tastes and the ones you’d most like to cook (even if you have picky kids). Based on my experience, whether you’re experienced in the kitchen or not, you’re going to enjoy not only eating these meals, but preparing them as well. View our original Sun Basket review video here. Sun Basket is not as well-known as some of the other "big" meal delivery services in the industry but they are definitely one of the best. They focus on delivering unique yet delicious recipes for a variety of different diets — paleo, vegetarian, gluten-free, and more. Their packaging design is also one of the most environmentally friendly that we've ever seen. Okay, I looked far and wide to find the right meal delivery service for me and my family. There are so many out there that promise the world. I was between Blue Apron, Hello Fresh, and Sun Basket. I decided to go with Sun Basket first and am very glad I did. I had a few goals with trying a meal delivery service. First, learn to cook. Second, make healthy meals for my boys. We’ve been eating takeout a little too often. Sun Basket was a great choice. It has the added benefit of being a bonding experience with my family. We like to cook meals together at least once a week. They love it. Does this meal kit deliver outside of the United States? Sun Basket currently only delivers within the United States. It’s possible as they grow that they will expand outside of the US to other countries. I got mono for about a month. This made it nearly impossible for me to go outside and interact with others as I was super contagious. To be quite frank, I was going insane being inside all day! So I decided to teach myself a new skill. I’ve never been a great cook so I chose cooking to be what I worked on while I recovered. Since I was sick, I couldn’t go out and get groceries from the store so I had to order. That’s when I found your review of Sun Basket. After reading some more positive reviews I decided to pull the trigger and order. It showed up a week later. After cooking all three meals, I actually feel a bit more confident in my cooking abilities haha! It was also good to finally have a home cooked meal. Glad to hear, Ari! Hope you’re feeling better. Okay, story time… I used to be a really bad cook. I mean REALLY bad. I could take the easiest such in the world and make it taste horrible. I blame my mother for never teaching me. Nevertheless, I somehow was able to survive on cereal and takeout until I was 31 years old, when I met my now husband. We had just started dating and I wanted to impress him with my future wife abilities but I really had zero to be honest. So I decided to start by learning how to cook. I mean really cook. I bought books, courses, etc. Of course, I never had the time to invest in any of them so I felt like a failure for a while. That was until my sister told me about meal delivery service. Then it all clicked! I could use a meal delivery service to learn how to cook. By the end of the second week using Sun Basket I felt like a pro. Now, fast forward one year and I’m the one who does all the cooking! Moral of the story: if you’re a bad cook, you can use Sun Basket to become a better one like I did :). How would you compared Sun Basket and Home Chef? I’ve been torn down the middle in choosing between either of them. My son wants to learn how to cook and I think this could be a fun activity for us. Both are great choices but for different reasons. If you’re looking for a more health oriented or “diet” meal delivery service, I would check out Sun Basket. They have tons or variety when it comes to their different plans such as Paleo, Lean & Clean, Vegetarian, and many more. If you’re looking for quick-to-prepare meals that are also relatively (but not always) healthy, go with Home Chef. We really love both services so you can’t go wrong with either. Who needs to go out food shopping when you have a hundred different meal delivery kits like Sun Basket to choose from haha. But seriously, I have tried a couple of other bigger meal kit companies and Sun Basket has a good balance of everything I am looking for. They are healthy, don’t break the bank and are simple to make. Now what more can a girl ask for? My daughter in-law brought this over last weekend for us to try. We’re so used to pulling out the recipe book and driving to the grocery store. I didn’t even realize they made these kits now! Everything was very tasty. We had a burger but apparently it was healthy? Well, that’s what it said on the nutrition label. I was doing more research on this company when I found your review. It is very thorough!! Thank you for it and the video made me hungry! Thorough! I wonder though… My child is a picky eater. We have him on a gluten free diet because he has been having issues with his stomach and digestion. Obviously this makes feeding him much harder. When we first learned about gluten free cooking I was totally in the dark! Now I have a better handle on it but I still am barely cutting it as a chef, haha. Would you think the gluten free menu option would be tasty for a picky eater? He’s not big on trying new food but I think this could be a good option to introduce him to new things. Also, I want to learn to cook new (and tasty) gluten free recipes. Thank you for this review!!! Hi Ashley! The gluten free options are delicious :-). I suggest trying out one month of Sun Basket to see if he’ll like it. Use the coupon code for money off your first box. If he doesn’t like it, they allow you to cancel any time. Been trying to make a decision for a while now on these meal kits. I feel like they’re everywhere these days. Of course blue apron was my first choice but I watched some reviews where people weren’t too fond of them. I kept reading and found this review of Sun Basket but want to ask a question before I order. Would you consider this a weight loss type of meal delivery service? It seems like it has a lot of “healthy” options but I just want it to actually taste good. I wouldn’t classify Sun Basket as just a weight loss meal kit. Yes, they have a great “Lean & Clean” plan that people use to eat healthy and lose weight but the meals they deliver are not bland (if that’s what you’re asking). Love the cute animations to see you cooking!! Which plan should i order for a family of 4? We are all picky eaters but I need something that we can make quick that is going to be healthy for all of us. We can not continue to eat out or at fast food every night like we have before. We need to make a change but I have very little time to prepare food after we all get home because I work until 8 at night most days. Hey Sharon! Check out the “Lean & Clean” and “Quick & Easy” plans. They’re both great options based on your needs. I took the meal box quiz on this site and it told me to get the Sun Basket box based on my what I’m looking for. My question is if I decide to get their meals can I switch between plans? Like if I start with the Lean and Clean plan, can I switch to the Gluten Free one? That’s what is holding me back from actually ordering. I don’t want to be stuck with one plan, not like the meals and want to change but can’t. Hey Cary! Thanks for your question. Yes, you can definitely switch between Sun Basket plans.